Rabbi Eli Ben-Dahan speaks about IAF assault on Gaza - and why now, more than ever, is the time to build Jewish communities. 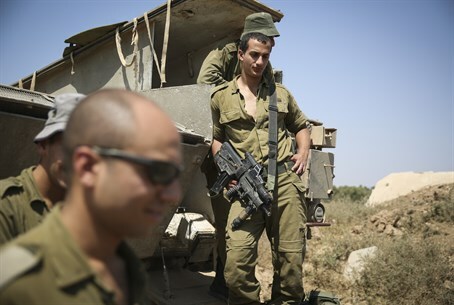 Deputy Minister of Religious Affairs Rabbi Eli Ben-Dahan (Jewish Home) spoke to Arutz Sheva about Operation Protective Edge on Wednesday morning, expressing his support for the IDF operation in Gaza. Rabbi Ben-Dahan noted that the escalation in Gaza, from which terrorists have fired hundreds of rockets on Israel over the past week, proves that Jewish communities must continue to grow. Wherever there are communities, he said, there will be an army that can deter rocket fire. "But if, G-d forbid, we withdraw from a place - there will be no people, no military, and no rocket fire," he stated. Rabbi Ben-Dahan also wondered Wednesday why supporters of the 2005 Disengagement from Gaza (Gush Katif) have been silent since the rocket fire escalated earlier this month. "Anyone who claimed that there would not be katyusha rockets on Ashkelon: what do they say now?" he asked. Rabbi Ben-Dahan noted that the operation is a just one - not only against the rocket fire, but also in the wake of the murder of abducted yeshiva students Naftali Frenkel (16), Eyal Yifrah (19), and Gilad Sha'ar (16). "Following the murder of the three boys, we have to give them the Zionist answer: approving the Levy Report, announcing new communities and full sovereignty in Gush Etzion, and more." The 2012 Levy Report reached the historic findings that, according to international law Israeli communities established in Judea and Samaria are entirely legal, and the area does not have the status of "occupied territory." The committee recommended, among other things, clarifying the legal status of the small "outpost" communities in Judea and Samaria, as well as allowing private construction in the region. Regarding Operation Protective Edge, Rabbi Ben-Dahan stated his belief that the Security Cabinet's change of mind could bring results. "Over the last two days we have seen the Cabinet change their position on Gaza and approve heavy airstrikes [there]," he noted. "I believe that the operation will bring results. Whether the Air Force continues its current attack rate or increases it, there is no doubt that Gaza will look different when this is over." He concluded by calling on residents of the south to remain strong. "I grew up in Be'er Sheva and I call on all residents, including friends and relatives, to be strong and confident in their future," he said. "I am sure the operation will yield positive results."